Texas joins the growing movement to get food-truck customers to vote. A few weeks ago, when the founder of the group called Latinos for Trump went on MSNBC to warn of a deliciously dystopian future in which immigrant-staffed taco trucks would invade every corner of the nation, many Americans leaped on this unusual convergence of carne asada and national politics as an opportunity to wonder whether voting and tacos can go hand-in-hand. As CityLab reported, one county official in Idaho came up with a food-truck-inspired mobile polling scheme. Now taco trucks in Houston are registering voters. 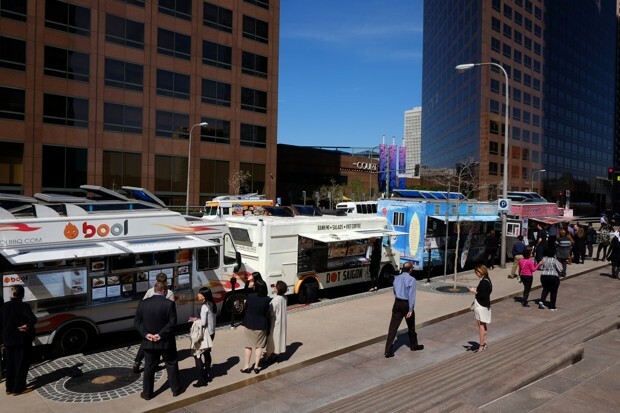 On Tuesday, which doubled as Taco Tuesday and National Voter Registration Day, local design firm Rigsby Hull teamed up with the nonprofit Mi Familia Vota (MFV) to send out a fleet of eight taco trucks that will also serve as registration booths. The campaign, which emerged in response to Marcos Gutierrez’s comments, runs until October 11, the last day for voters to register. This is an issue of particular urgency in Texas, which has had one of the nation’s worst voter turnout in past years, ranking second to last during the primaries, after Louisiana. When Duarte visited the Tierra Caliente truck, he got a hint of why: While most white and black patrons said they were already registered, many in the Latino community weren’t. Some took forms for themselves, others lacked citizenship but grabbed one for a family member. And still others simply claimed they just weren’t going to vote this year—“believe it or not,” he says. The staff at MFV has been training owners on how to engage their customers. And while the organization can’t send volunteers to every site, Duarte says they try to stop by a few trucks during peak hours to answer questions about the voting process. “Even if not everybody who comes needs to be registered, or is eligible, the conversation that civic engagement is so important is also part of our message,” he says. Consider the taco you buy afterwards as a reward—a pat on the back, if you will—for fulfilling your own patriotic responsibility.